We're here with Phil Casanta. He is the owner of a Specialty bike shop and Fit Studio in Ventura, CA called Hypercat racing. 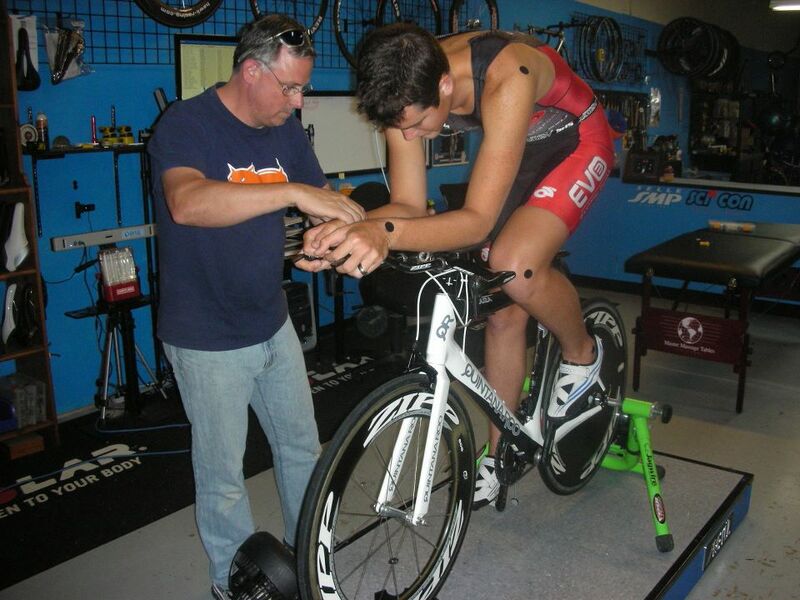 It offers traditional bike service in addition to world class coaching and bike fittings. 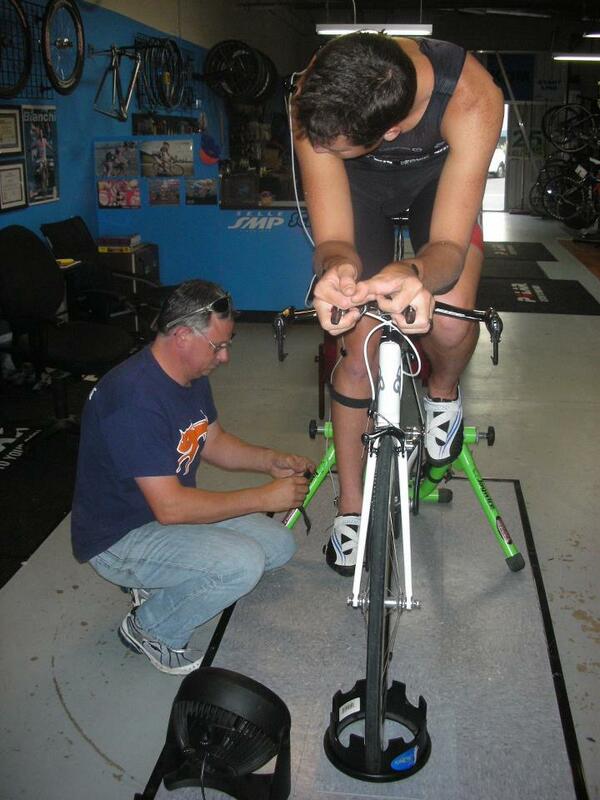 I was searching for a bike fitter last year and he came highly recommended from Jordan Rapp and Jill Savege. He set me up on my Quintana Roo Seduza after identifying my ideal fit. Let me tell you, I have never felt so dialed in on a bike. The first ride felt like I was melded into the bike. After that fitting, I started calling him 'The Wizard' and I wouldn't take my bike anywhere else. In addition to being a Retul and FIST certified fitter, he is also a MONSTER athlete with a PR of 14:06 in the 5K and 29:34 10k!!! He also raced professionally as a mountain biker and raced as a Cat 1 road cyclist for over 10 years around the globe. JP: Thanks for the time, Phil. First off, tell us what got you into endurance sports? Phil: Like many people I started very young. With cycling it came in the form of my Schwinn Mag Scrambler around 6 or 7 yrs old. I took every opportunity to ride my bike and even road it once just because to the next town 25 miles away. Running was a series of events throughout my school years that had me trying many different distances. I just simply liked running or riding or being outdoors and didn't give it much thought initially. I ran or rode because I could and it was fun. By my teen years I found competition and more importantly found I was good at it and the set me up to continue to want to do more of whatever I was good at. Running and cycling led to my first duathlons at age 14 and my first Triathlon by 16. This was the mid 80's so most of the events were small club type events but they did let me get a feel for what I liked and find my first sponsors. By the time I left High school I was running for Asics and still competing in Duathlons . After that came a career in cycling and to now. JP: You seem to have absurd natural ability in just about everything under the sun. What sport is your favorite and why? Phil: My two favorite sports are actually Tennis and competitive Rock climbing. Tennis is more of a passion for me, I can't explain why I love it, I just do. And with Rock Climbing (bouldering to be even more precise) what's not to love. Its a great workout, a fantastic logic problem, and you have a tactile connection with nature that you can't get any other way. JP: Looking back, what sporting accomplishment are you most proud of? Phil: I have 3: #1 - 2nd place in a bouldering competition in Arizona where I flashed 3 V10+ routes. #2 - Climbing an Ice wall on Ben Nevis in Scotland and then staying on top overnight #3 - My first marathon. JP: How did you make the transition from athlete to owning Hypercat Racing where you are basically a one stop shop as a master fitter, mechanic, and coach? 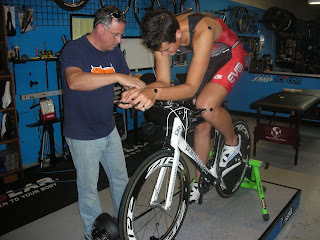 JP: Specifically, how did you get into bike fitting? Phil: Many people have asked me this and I am not entirely sure. But I do know that my early bike shop days in the mid 80's were in shops that were race shops and provided great customer service including setting a rider up on their bike. around this same time I discovered Time Trial racing and as I was competing in Duathlons/ Triathlons I became fascinated with the notion of position analysis and that your position on the bike could effect outcome. So it really coincided with my fascination and discovery of aero equipment. The true start of "Bike Fittting" began around '93 while working in San Francisco. I helped set-up a couple riders on their TT bikes and and then a few Triathletes with the then new Golden Gate Triathlon Club and that started a referral system that is still alive today. JP: What do you think defines a good triathlon fit? Phil: Comfort. if you can't sustain the position then the position is useless. Triathlon fits differ from other aero fits in many ways but the most important difference is in bike handling and the reduction of stressors. You want to reduce the amount of issues that can affect your run. JP: What would you say is the best upgrade an average age grouper can make to his/her bike? JP: You always tease me for having a dirty bike. I am trying to change my filthy ways so what are a few tips for keeping your bike in tip top shape? Phil: Wipes. There are several on the market now. I actually have a shop full as I am working on a blog review, but keeping a tub of wipes handy makes things easy. Also use the right lube for where you ride and learn how to lube properly. JP: Alright shifting gears (pun intended) to the lightning round of rapid fire questions! Mountain Bike or Road Bike: Cross, why choose? Ironman or Olympic distance: ITU Olympic, love me some Draft legal. Beer or Wine: What are we eating? JP: Thanks so much for the time and for locking me into an awesome fit.